How is it that the bag ladies use to carry their stuff can cost more than the car that they use to carry themselves and their loved ones? We all know that it happens, and here are some examples of total indulgence with just a touch of extreme opulence for flavour. And sure, sometimes its important to have that one feel good item �in your list of belongings, the one that gives you that sense of luxury. While that feeling may be priceless, as they say, in this case if it is a handbag that gets you there, here are a few price tags that actually can�be applied. True, I am a guy and I just don’t get this whole handbag thing. Us men use wallets, and one is usually good enough for any occasion and can last forever with enough duct tape. Maybe because it fits in a pocket – unless yous evolve to Costanza proportions – and is just less of a fashion statement. Plus nobody really sees it so it must be ok to take it to more than one party. Wallets are seasonal and there is no “must have”; in fact, most men are not aware of any “fashion cycles” to begin with. But give a guy a watch or a car and that is a whole different story. Seems like anything after that $30K price-point is just so mass market, so here is one that puts the fun into functional ! This bag, not the most expensive by any means, but one of the most specialized! It has been the called the most expensive iPod accessory (aside from jewel encrusted ear buds, and over the top non-functional stuff like that), so makes this list for its dual “Hey look at me” factor. 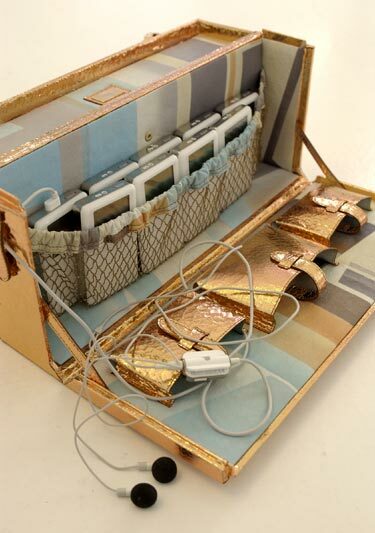 For the true music junkie, you can transform your carry bag into a little iPod studio with all the accessories you could ever want, each with its own little stash� compartment. It must be tough getting through airport security with this bag full of electronics. 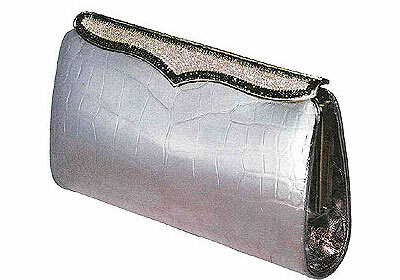 In a theme almost as prevalent as diamond and jewell coverage, once again – with these bags, crocodile skin all around! Regular versions of this bag can be had for pretty affordable prices, but if you want to jump above the crowd – no problem. This bag can also be made to be on the exclusive list when made to order from sable or Chinchilla, which jumps the price up to the realm of “not for your average shopper” faster than you can say cha-ching. 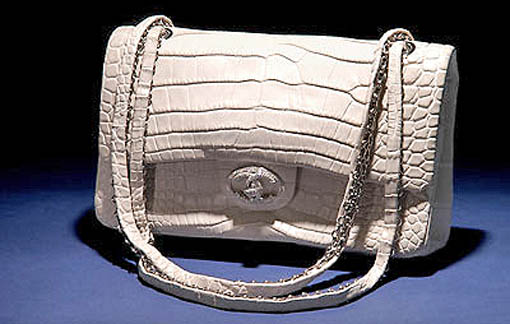 Hilde Palladino, the Norwegian designer, created the Gadino Bag which is made with white crocodile and 39 diamonds which are placed on the clasps. 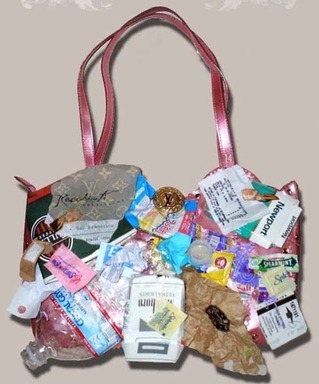 The bag was specially made for a Vuitton Tribute, designed by Marc Jacobs and made up of pieces of 15 other Vuitton bags (reuse and recycle?). 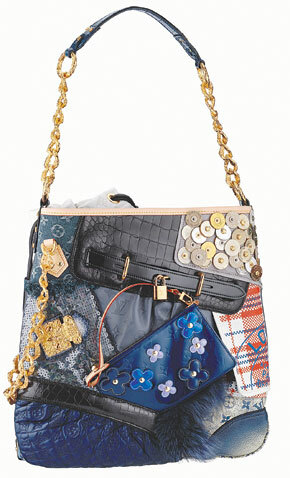 When they were introduced in 2007, the Patchwork series of bags sold out worldwide. Only 24 were made and have all been delivered according to a USA Today article, which you would think would lead to making them valuable collectors pieces skyrocketing in value. Or not – because Vuitton today launches its similarly named Patchwork collection of denim patchwork bags, priced from $3,000-$5,000. Bought one of the first? Ouch � that�s gotta hurt! 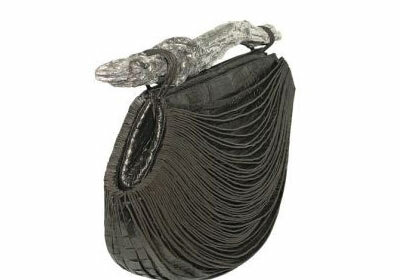 Every year, high end designer queen Marks only produces one Cleopatra clutch. Just like Cleo, lots of gold, diamonds, lots of attention. Prices can vary but guaranteed – they are never below that magical $100K baseline. They made it and broke the mold. Literally.� There was only one made, and is named after singer/songwriter Jane Birkin. The clasp of this 30-centimeter tote is covered with 10 carats of white diamonds, in case the price seems to need justification. The body is made of crocodile. Crikey! I wonder if the croc knew how much he was worth? 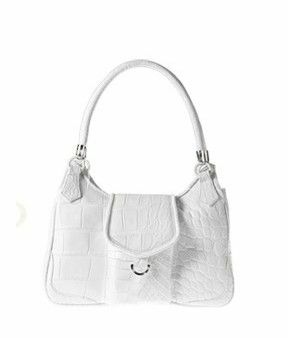 Made of the world�s finest Italian leather, this unique luxury handbag is hand crafted with carefully chosen �urban charms�. This sounds like a nice way to say that it looks like it is made of a bunch of random things from the Blue Bin, but then recycling is in, so why not bilk it for bucks while you can. With only 13 available worldwide, this handbag sits upon the accessory throne as one of the most expensive luxury handbags in the world. The Chanel Diamond Forever Classic Bag overall has 3.56 carats made up of 334 diamonds, 18 carat white gold hardware, and white alligator skin. Only 13 were produced for the world. 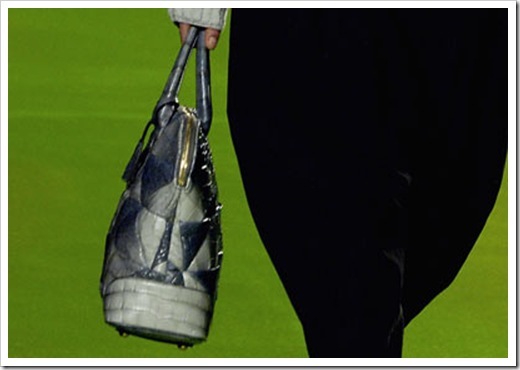 This Hermes bag was sold in 2008 for $1.9 million, jetting it to the top of the list. 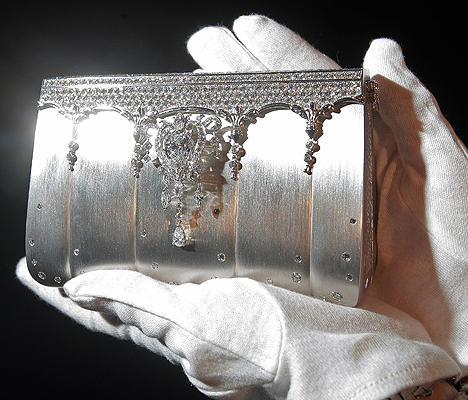 It is made of platinum and has over 2,000 diamonds. More than just a handbag, this baby has some functional value too; you can also use the diamond strap as a necklace or bracelet by removing it from the bag. 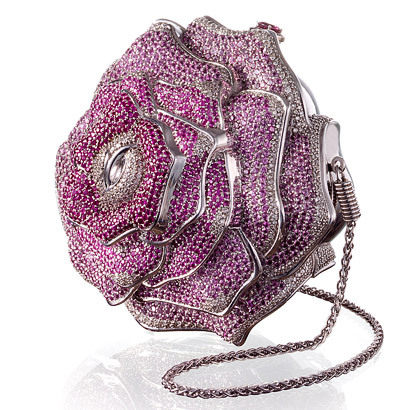 The bag itself has an 8-carat pear shaped shimmering diamond that can also be used separately for, well…whatever. Nice bags. I appreciate your post, thanks for sharing the post, i want to hear more about this in future. Totally high fashion designer handbags but the price is way too steep. With the current economic recession I would settle for something more affordable. Hello, I enjoy your article. This is a great site and I wanted to post a note to let you know, great job! Different people have different choices, I like these handbags very much, at the same time, another handbag – Louis Vuitton Monogram – in my opinion is also classic! Jimmy Choo Shoes gucci bags ebay christian louboutin knockoffs christian louboutin valentino handbags discount. There are some great bags on this blog. Thanks. i dont know how describe your blog,it really pretty,i can learn some from your blog…thanks! this is so interesting! 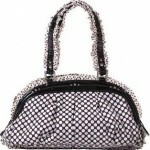 by the way, visit this page http://totellyhandbags.com and you will find everything about handbags for you! see you there! I at fundament enjoyed reading your blog and rest it both educative and interesting. I embark on be unwavering to bookmark it and upon it as instances as I can. 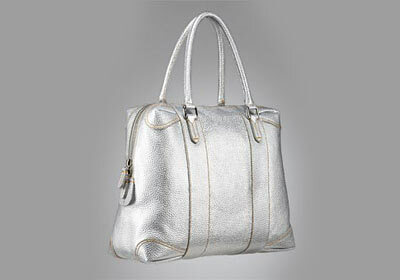 will find everything about handbags for you! see you there!